Nothing in progress at the moment, and my computer is having some work done today (facelift) so I'll be busy working on that rather than pattern making. I did finish last week's WIP. I think I give up on trying to take good pictures. Too many lighting and set up issues right now. It looks much better in person. 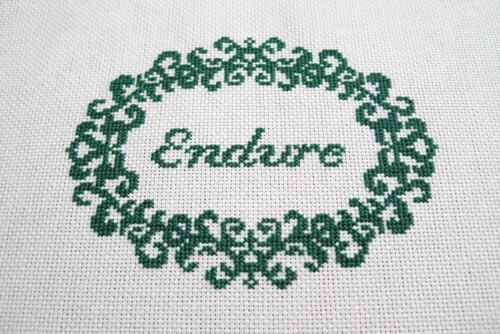 I got the idea from a book I read recently where the main character had to get through an awkward situation and kept telling herself to "endure". I thought it was a pretty relevant word for me right now.